(CNN) - The Church of Jesus Christ of Latter-day Saints has apologized for "a serious breach of protocol" in which the parents of the late Nazi hunter Simon Wiesenthal were posthumously baptized as Mormons. The church also acknowledged that three relatives of Holocaust survivor Elie Wiesel were entered into the genealogy database, though not referred for baptism. Asher Wiesenthal and Rosa Rapp were baptised in proxy ceremonies in temples in Utah and Arizona, according to the database records discovered by researcher Helen Radkey in Salt Lake City. The Wiesenthal baptisms violated a 1995 pact in which the church agreed to stop baptizing Jewish Holocaust victims. "We sincerely regret that the actions of an individual member of the church led to the inappropriate submission of these names," said church spokesman Michael Purdy. "These submissions were clearly against the policy of the church. We consider this a serious breach of our protocol and we have suspended indefinitely this person's ability to access our genealogy records." Mormons believe that they may be baptized by proxy for deceased ancestors who never had that opportunity. Church members, however, are supposed to request such baptisms only for their own relatives, Purdy said. The agreement over Holocaust victims came about after it was discovered that hundreds and thousands of names had been entered into Mormon records. Jewish leaders said it was sacrilegious for Mormons to suggest Jews on their own were not worthy enough to receive God's eternal blessing. Radkey, who has been tracking Mormon genealogy records for a while for people who ought not to be there, said she inadvertently stumbled upon the Wiesenthal name a few weeks ago. Among others people she discovered had been baptized by proxy is President Barack Obama's mother, Stanley Ann Dunham. The Simon Wiesenthal Center denounced the baptisms. 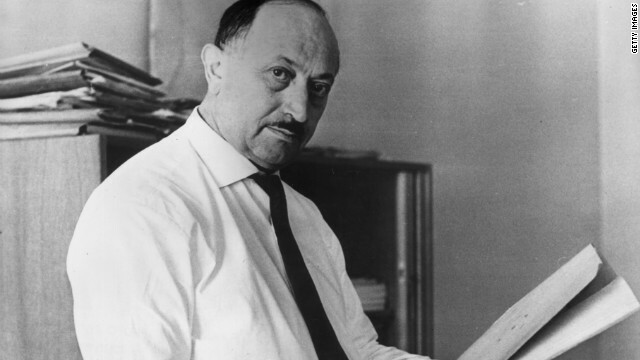 Wiesenthal's father died in combat in World War I. His mother perished at the Belzec concentration camp in 1942. Holocaust survivor Simon Wiesenthal died in 2005 after spending years hunting down Nazis. "We are outraged that such insensitive actions continue in the Mormon Temples," said Rabbi Abraham Cooper, associate dean of the Simon Wiesenthal Center, who participated in many of the high-level meetings between Jews and Mormon officials. "Such actions make a mockery of the many meetings with the top leadership of the Mormon Church dating back to 1995 that focused on the unwanted and unwarranted posthumous baptisms of Jewish Victims of the Nazi Holocaust," he said in a written statement. He expressed gratitude to Radkey for "exposing the latest outrage." Radkey also found the names of relatives of Wiesel, a Holocaust survivor, author and Nobel Peace Prize laureate. "In this case, the Wiesel family names were not submitted for baptisms but simply entered into a genealogical database," Purdy said. "Our system would have rejected those names had they been submitted." Purdy said it was "distressing" that church members had violated policy and regretted that "an offering based on love and respect becomes a source of contention." Radkey said the church makes such breaches possible because any member can submit a name not connected to their own family. "There are way too many entries slipping through the cracks, including Jewish Holocaust victims," she said. "It's (the Mormons') belief to save the dead that is causing the problem." Wiesel, meanwhile, told the Huffington Post that Republican presidential candidate Mitt Romney, who is Mormon, should speak to his own church and tell them to stop the practice of proxy baptisms on Jews. Does your website have a contact page? I'm having a tough time locating it but, I'd like to shoot you an e-mail. I've got some suggestions for your blog you might be interested in hearing. Either way, great website and I look forward to seeing it develop over time. Seriously, both sides should take a chill pill. What is the harm in a name in a book? Better safe than sorry. Add my name to the book and also to the Jewish and Muslim versions. I herd a lot of things abt Mormonism but I never herd this one and it is BIZARRE to say the least, U dont get many things past Jews. What a gross insult, indeed.